Is fall shopping taking a bite out of your budget? 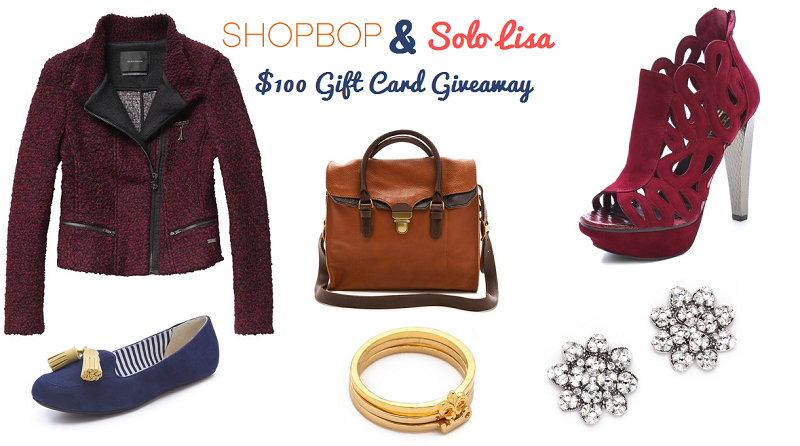 Maybe a $100 gift card from Shopbop will help take the sting out of your next purchase, whether it's coloured designer denim, a new coat, or a buttery soft pair of leather boots. These are just some of the treasures you'll find on Shopbop: Maison Scotch jackets (love the burgundy wool boucle moto), Charles Philip loafers (such fun styles and colours), Madewell clothes and accessories (I have my eye on the 'Lovelock' tote), Gorjana rings, House of Harlow 1960 booties, and Enchanted Atelier bridal accessories. To enter, leave a comment on this post by Friday October 12, 12pm PST telling me what you're planning to spend your gift card on if you win. The comment must have some means of contact (email, Twitter, or blog). One winner will be chosen randomly. International entries welcome. Good luck! UPDATE (October 13, 2012): The winner is Lisa_Cheng! I would buy a Marc Jacobs wallet. Those Charles Philip shoes are adorable! Thanks for sharing them Lisa. I would definitely buy a Clare Vivier clutch! I've had my eye on it for weeks, and Shop Bop has free shipping to Canada <3 <3. Madewell without a doubt. I get their enewsletters and every one of them gives me clothes envy. So many cute things. Love that burgundy moto jacket by Maison Scotch that you found! hi, this is a great giveaway! I love shopbop! If i won, i would go for a rebecca minkoff bag. I would go for some statement jewelry or pants! Fun contest, enjoy the day! I would get a new pair of 7 for all mankind jeans. Thank you for the giveaway and the chance! If I win I would get Club Monaco's Shoshana Shirt! I would use it to get a new wristlet or a small clutch to carry my everyday cards/keys/money and S3 in because my old one does not fit the S3 and it's exploding with cards and coupons. It's also easy to throw in my backpack when I bike to work and stuff so I can just stuff the backpack in my gym locker and just carry the clutch around. I would get a Marc Jacobs crossbody bag, unsure of which one right now. I would love to spend it on a pair of Tory Burch Reva flats! I would put it towards a pair of alice + olivia pumps! I would get a Marc by Marc Jacobs wallet! I'd get the Zane blazer by BB Dakota! I am absolutely in love with the Michael Kors Wayland booties in desert!! i'd get the DVF rabbit fur snood! I will get the BB Dakota Schrader Jacket! A new pair of JOe's Jeans! I would get a pair of Marc Jacobs sunglasses. I'd use this to get a new jacket. I've been needing to replace my jacket for the last couple years but have just been way too broke to do so. I would use it on some Gorjana jewelry! I would put it towards the purchase of either the Petal To The Metal Natasha Bag by MBMJ or Robinson Double Zip Tote by Tory Burch. I'm going to look at gloves- I am daydreaming about cool new gloves for fall! Love love love Shopbop - even more when they're having a huge sale! Definitely a pair of flats! How about the Adalyn dress? I just love the cozy and tender look of it. I think I might choose any of these sweatpants,or wait till they have more socks since it's starting to be cold here! Thanks so much for sharing such a great giveaway!!! I'd love to get a new handbag! Loving the Tory Burch Robinson Tote! How generous! I'd love a new pair of Frye boots! I would love to buy the Boinita Ribbed Up Cardigan Dress along with the So Low high waist leggings....perfect for Fall! I need all sorts of fall clothes, so either a jacket or boots hopefully! I'm thinking something leather, like these pants. Yeah, leather... I'm obsessed. I would buy a pair of sevens skinny jeans. I definitely would get Ray-Ban Aviators! I totally need a moto jacket this season!! The Marc by Marc Jacob cross body bag looks good. This GC would definitely help me out with a fall jacket purchase! It's getting cold outside! I saw your twitter update and came over to comment right away! Wonderful giveaway Lisa! If I'm lucky enough to win I would spend it on the Young Fabulous & Broke Howell Jumpsuit. I like the basics - Chambray Button Down Shirt for moi!